A resident of Vancouver, Canada has started a new church. The Church of Sit Up Cycling. Cycling 'enthusiasts' have long exhibited a passion for their hobby or sport that resembles religious observance. 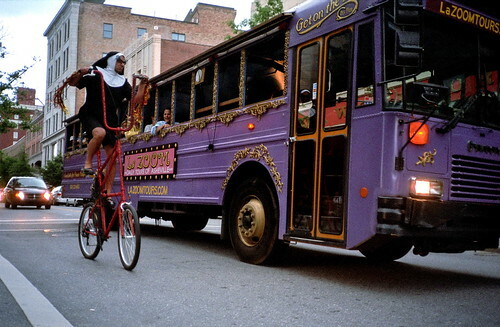 Now the realm of worship has come to the aesthetic art and act of regular citizens riding upright bicycles. We like this theological uprighteousness. 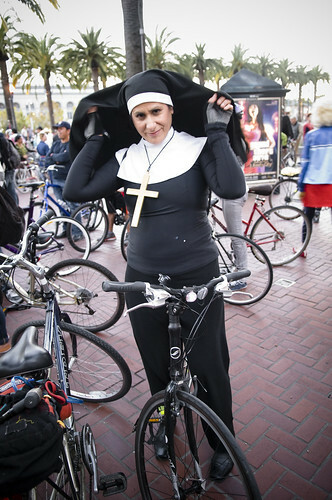 Wearing their normal work and play clothes is an essential religious practice of members of the Church of Sit-Up Cycling. This may or may not include wearing plastic hats. Believers wholly endorse the use of such accident-preventing safety measures as lights, bells, height, strict compliance with traffic signals, a leisurely pace and the use of dedicated cycling streets and lanes. Among the individuals who could claim this exemption are Sikhs. And now, perhaps, the Church of the Sit Up Cycling. It's all good fun and tongue in cheek. An attempt to separate regular citizens from the enthusiasts. Cycling in regular clothes and all that. Funny idea, but it made me think back to a similar idea here in Denmark - and quite possibly elsewhere. Copenhagen Lads is a fan group who support F.C. Copenhagen. A few years back they put in a serious application to the Danish Ministry of Ecclesiastical Affairs in order to have their fan group recognized as an official faith. Well, there was a certain irony to the application, but they gave it a shot. They ended up featuring prominently in theologist Povl Götke's book From Buddha to Beckham – Karisma and Suggestion in Spot and Religion. There is also a Maradonian Church / Iglesia Maradoniana with 100,000 members in 60 countries who worship the Argentine footballer Diego Maradona - of questionable Hand of God fame. Their application made it past the first firewall protecting the application from crackpots but it was eventually rejected because they failed to describe some concrete criteria like wedding rituals and suchlike. Another recognized religion in Denmark is Forn Sidr, which is the pagan faith of the ancient Danes and the Vikings - The Asa faith. "I've been unable to come up a list of recognized religions in BC, this loophole seems wide enough to drive a truck through. Indeed the government seems most keen that citizens workship in whatever way they want". As per this website. All praise the Sit Up Bicycle. I'm eagerly awaiting my annointment. Feel free to brainstorm in the comments about what kind of rituals the Church could integrate into their dogma. The Church of Sit Up Cycling has a website, a Facebook group and a Twitter account. The Onion has an amusing article about Fictionology.